A Round Up of Issues! I thought I would let people know about some of the issues in this neighbourhood. As well as our regular newsletters, I will try to keep residents informed by email and via the blog as well from now on. Town Meadow Lane: thank you to everyone who has replied to my recent letters on the demolition of the derelict flats and shops. The planning application for new houses and shops on the site is expected to be voted on by the Planning Committee on 7th September. I have submitted a petition to support the plan, signed by more than 300 local residents. Linear Park play area: I was contacted by a couple of mums, following damage and vandalism. I would like to thank the Council’s staff for responding quickly to fix the fencing and the bench. Dog fouling: sadly, there is still a minority of owners who do not clean up after their pets. I have asked the Council’s new Enforcement Team to visit this part of Moreton and, hopefully, identify some of those owners. Pasture Road Health Park: the long-awaited Health Park in Pasture Road has been delayed. It seems that one of the four GP practices has withdrawn from the scheme. A new planning application will now have to be submitted by the NHS to the Council, to relocate some of the GP practices in Moreton to this single site. 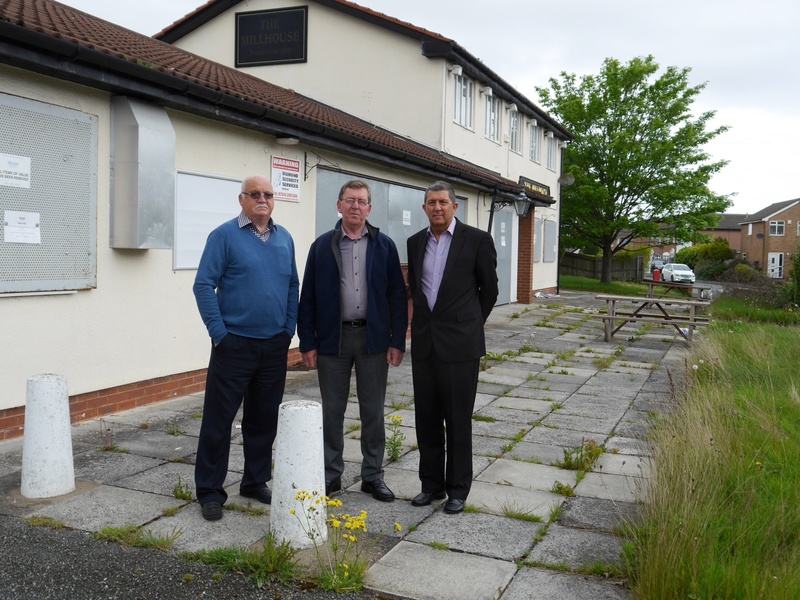 Bermuda Road housing plan: I have spoken with many residents about the plan for six semi detached houses on derelict land at 91 Bermuda Road. Planning officers have advised me that the current application is likely to be refused because there are not enough ‘affordable’ homes (for example, for first time buyers) in the scheme and therefore it fails to meet the Council’s Interim Planning Policy. I’ll let residents know when I hear more. Upton Woods: some residents will be aware that, following the public meeting I attended, the Council has installed the fencing between the woods and Paulsfield Drive. Sadly, the Council’s new Cabinet has refused to install the ‘heavy duty’ barrier between the woods and the bypass. I will be looking for alternative sources for the money to pay for this. Christchurch School parking: following a meeting with the Headteacher, it has been agreed that a small ‘working party’ will be set up to see what can be done to reduce some of the parking problems around the school. I will report back on this shortly. Hot food takeaways: many residents have been in touch with me following concerns about problems at some of the hot food takeaways around Moreton. I have asked for the Council’s Licensing Officers to check that conditions of trading, including opening hours, are not being breached. Deep clean: last month, the clean up of Moreton Cross saw bags of litter and rubbish removed, graffiti tackled and repairs to ‘street furniture’. The pavements were also power washed. I have asked the Council to make sure litter bins are emptied regularly from now on. If you would like my help on any issue in your neighbourhood, please do not hesitate to contact me. Previous postIts All About Teamwork! Next postAnd the Winners Are? While everybody welcomes Town Meadow Lane having new houses built and the area improved, despite the traffic mangement attempts the road is still unsafe with the parking on the bend near to Wastdale Drive. Could not the scheme provide some private car parking in the area in front of the TML flats. As the risk will increase with more cars being in the area.